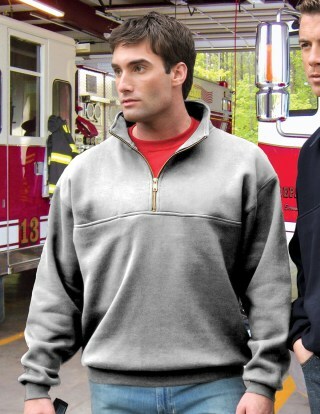 The preferred work shirt of firefighters, E.M.T.s and civic workers, the React is a 12 oz. (20 oz. linear) 80% cotton/20% polyester pullover sweatshirt. Brass zipper zips up for turtleneck design. Rib knit on cuffs and waistband. Features a 9" deep right chest pocket for radio, and separate inner pocket for notes.